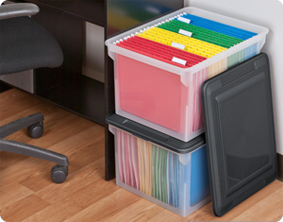 Keep your office and workspace neat and organized with the File Box. 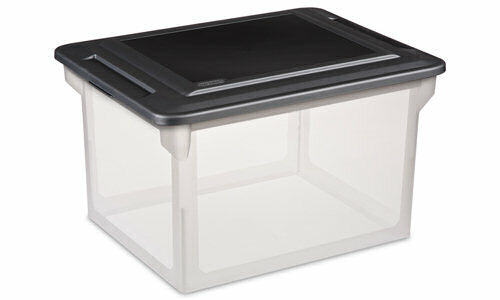 This is an ideal solution for keeping receipts, bills, taxes, and school/household/ office paperwork sorted and contained. 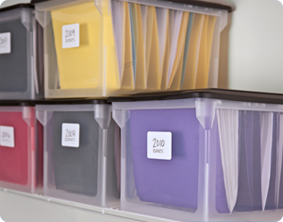 Customize and label either letter or legal sized hanging folders then file away those important documents keeping them neatly organized, while reducing clutter around the home or office. The tight fit snap lid keeps files dust free and protected, while the indexed top allows for multiple File Boxes to be stacked maximizing vertical storage space. The contoured design provides a comfortable grip surface for easy transporting, when files need to be taken on the go or relocated. The overall dimensions of this item are 18 1/2" L x 14" W x 11" H.
Overall Assembled Size: 18 1/2" x 14" x 11"
File boxes are ideal for organizing letter- or legal-size files helping to sort paperwork, school documents and more in an office or around the home helping to reduce clutter. File boxes are ideal for organizing all your tax documents by year keeping them dust free and neatly stored reducing clutter and allowing them to be easily found should you be audited by the IRS. File Box is rated 4.9 out of 5 by 8. Rated 5 out of 5 by Wolfie from This is a great add on to my permanent file cabinets. I use it for most current documents. I use this file box all of the tools me. There are several boxes saved for storage. Great value for a great product. Rated 5 out of 5 by Judy58 from Excellent product I have purchased several of these file boxes and find them very, very useful for my home office. They accommodate just enough files to make them very portable, and their see-through feature makes it quite easy to see what I am looking for before even open the box. They are quite stackable and just an excellent addition to the storage component of my office. Thank you! Rated 5 out of 5 by vjr from This file boxes are awesome This is cheap, durable, excellent quality, multiuse , and not just to file cabinet, I found Xmas stuff saver too, clothes saver and much more. This would be awesome if Sterilite create a CABINET with this drawers. I definitely buy it. Rated 5 out of 5 by kerryk from THIS IS PERFECT FOR DOCUMENT STORAGE I use these buns ti keep track of important papers in advance of tax season. Each of them serves a purpose and it is easy to keep things organized. 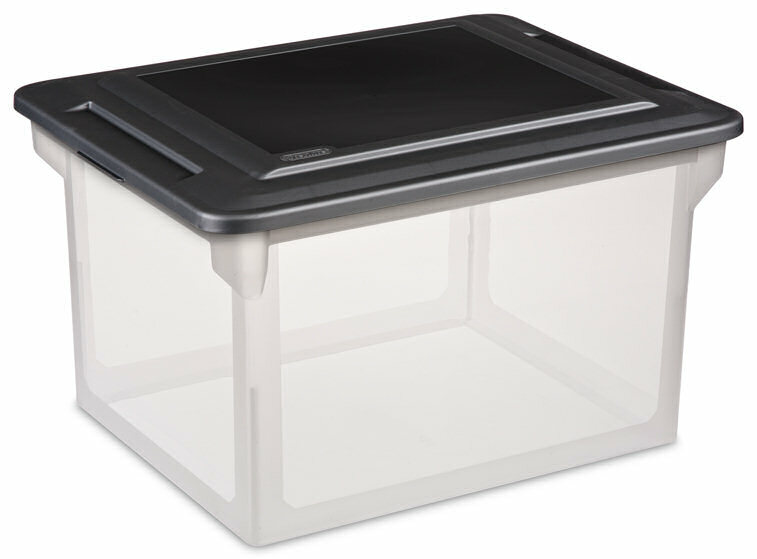 Rated 5 out of 5 by techteach from practical, neat storage for files This box is an excellent choice for storing paper files. Its simple, clean design makes it easy to use and store, and the plastic helps keep files safe and dry. The size is just right - big enough but not so big that full boxes are too heavy to move. Rated 5 out of 5 by Sandy Ferguson from Features a comfortable grip and is a convenient size. These are the features which had me purchase several: * The grip is comfortable for carrying. * The size is good. * They stack together well. * The lid has a snug, but not super tight, fit. * Files hang freely, but without too much play. (Easy to insert and remove file folders. Papers don't slide out the sides.) * The absence of openings. (Reduces chance of bugs and rodents inhabiting tote.) Things I would have preferred: * A solid color, rather than it being transparent, to reduce UV damage. ALSO! If this came in a size which accommodated scrapbook pages....I'd be in heaven! Rated 5 out of 5 by Nellie from Feature I like is that it is clear plastic. I have purchased these clear plastic file boxes because I like to instantly see what I have in a box. Most of my purchases have been to place file folders in and keep personal paperwork separated and saved. It is just the right size perfect for placing my paperwork in order and dust free. The size of container is a good size to place in my closet. Highly recommend for this use. Rated 4 out of 5 by Femme_le_Bourge from Organize papers I love this file box. We call it the "fire box" in our home because if there were a fire, we know what to run and retreive first. The only thing that I would want more than this is the ability to have this be a drawer. Other than that, this file box stacks very well with the Sterilite family file boxes and it keeps hanging folders inside. There are grooves to have hanging folders stay put even through transportation elsewhere.